The Port of Columbia is also actively pursuing funds from the state legislature for much needed rehabilitation work to the entire port owned portion of the PCC rail line. The Port of Columbia assumed ownership of the rail line between Dayton and Walla Walla in 1996. 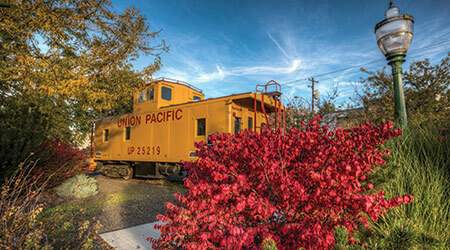 The line was donated to the Port by Union Pacific, and Frontier Rail operates the short line Columbia Walla Walla (CWW) Railroad on this section of line through a lease agreement with the Port. The section owned by the Port of Columbia is part of a 67 mile stretch of rail from Dayton to Wallula. The Walla Walla to Wallula portion is still owned by Union Pacific. Here’s a description of the Columbia Walla Walla Railroad service territory: Columbia Walla Walla Railroad operates freight service from a connection with UP at Zanger Jct. to Walla Walla, WA (27 miles). A branch runs from Dayton, WA through Walla Walla to Weston, OR. A total of 83 miles are operated. The CWW also provides freight service over a line extending from a connection with UP at Hooper Jct through Colfax, WA to Moscow, ID (78 miles). A branch runs from Winona to Thornton, WA (31 miles). A total of 109 miles are operated. The PCC has trackage rights over UP from Hooper Jct to Wallula. Traffic is primarily food products, grain, farm machinery and fertilizer. When referring to maps of the Columbia Walla Walla Railroad be aware that it may be referred to as the Blue Mountain Railroad (BMR). The following map of the rail area shows the Dayton section as part of the CWW and can be viewed here. safety concerns please call 509-540-9499.